The Defender Mission | Reclaim and Preserve Your Freedom...Join Us! The Order of Constitution Defenders. Primarily, we are God fearing, Constitutionalist and riflemen, who promote and pratice the American way of life and the all American Inalienable Right, 2nd Amendment activity of the lawfull use of guns in sports/ hunting/ defense and every aspect of the shooting arts. 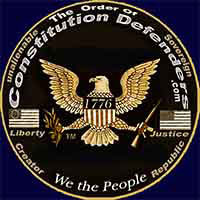 We consider ourselfs true conservatives of the Republic as orginally founded in 1776. We exist to protect and enjoy our sport as Riflemen and if called upon we will serve, We the People, in whatever capacity we can and are commited morally to protect anyone from harm but we will never initiate or cause any harm. We support and promote the cause of what was originally started by our founding Fathers in this country, consisting of God's moral laws, the American founding priciples and the God given Rights established in our Republic form of Government. Our Republic is made up of the original founding documents, the Christian Bible, Declaration of Independence, Constitution and Bill of Rights and we strive to practice and live these understandings to the fullest extent as originally written. Besides pursuing to perfect ourselfs as riflemen, we push and emphasize, foundational, organizational, physical, logistical and survival prepariness, so we are able to be of service when the time comes to help and serve our humanity and our Country. We also have participated and can help in legal/ lawful research for our members who's Rights have been ignored by individuals or by establish rogue Governmental process. We also speak and spread the word across the country to varies tea parties, gun rallies, gun shows, biker rallies, seminars and anybody that would listen about the true 1776 Republic standard and on occassion we exercise our Inalienable Right of the 1st Amendment, freedom of speech to peacefully assemble and protest to get our points across. In order to live by these priciples, we work to bring together strong minded, morally founded, truthfull, honest, loyal, individuals who are willing or do understand what a Constitutional Republic standard really is and it's defined limitations on Government. What is self evident is the fact that no one has any Inalieable Rights that is not willing to protect them by exercising there Right to Self Defense and so the basic fundamental 2nd Amendment Right must be protected and exercised. We encourage this basic priciple and do promote the pratice and honing of our skills as Riflemen similar in structure and organization like the NRA but with some distint defined differences. The Order of Constitution Defenders was founded in 2007. We are a non violent, exclusive, focused, serious, yet fun loving people. We pursue political issues, physical, and logistical problems to work toward creating an independent community who support our heritage of individualism and freedom. We are not anti-government or a militia but in fact we are pro a Constitutional based Government as originally defined in the year of 1776. Our Defender website was created to educate, bring together, organize, and help implement a Constitutionally correct, free, independent, self sufficient, and logistically strong community of Constitution Defenders, consisting of "We The People". Our 'Coat of Arms' was created to represent the Defenders and the old Republic of 1776. It signifies solidarity of purpose in our philosophical position, as defined by the Christian Bible, the Declaration of Independence, Bill of Rights as well as the Constitution in its entirety. When you wear the Coat of Arms (i.e. patch) you are a walking billboard of truth to America and the world. Wear it proudly! All who participate in our Order must be truthful, and swear an Oath to uphold the Constitution so help me God, the supreme law of the land of the united, States of America. The Christian Bible and the Constitution are the grand documents of the land and are the organic law, above all statutory codes, rules and regulations. The Constitution Defender will get in to many areas of humanity, philosophical thought, true law, disciplines, skills, trades, goods and services, organized events, guns, bikes, and the examination and exposing of dirty politics to promote liberty. The Order of Constitution Defenders swears an oath to you: We will not betray your patronage and support and will do everything necessary to bring America back to, "We the People"
Note: Your privacy is respected highly...as much as our own. We operate in strict confidentially. We appreciate any business to our store as it helps finance our efforts. All information on this page is proprietary, intellectual property of Eric A and Adam O Kiesche, Founder of, The Order of Constitution Defenders and is not to be copied without the written permission of Eric A. or Adam O. Kiesche.